Born one hundred years ago today, John Fitzgerald Kennedy entered the office of President of the United States with a great deal of promise, with only part of it fulfilled. Kennedy entered office in 1961, at a time of new possibilities, when new nations were forming in the Third World and the Soviet Union was pushing ahead to explore space. It was also a time when European countries, more than fifteen years after World War II ended, were re-emerging with established democratic governments and re-affirming their places in the world. The United States, by contrast, had slipped into a period of complacency brought on by a sense of conformity and contentment in the Eisenhower years. John F. Kennedy came into office declaring that we could do better - but only if Americans were willing to do better. Kennedy challenged the nation by talking about what he, as President, expected of the American people, not what he would offer them. In that respect, he got the nation to start thinking about creating a more just society, bearing the burden of preserving liberty, and building a country that would be second to no one. The success of the Soviets in sending a man in orbit around the earth inspired Kennedy to lead the country toward putting a man on the moon and returning safely to earth before 1970. He initiated the Peace Corps to foster goodwill among the newly independent nations of Africa and Asia. He moved forward on civil rights not only from being offended by bigotry but from being appalled by its lack of reason. "Kennedy was not a bigot," Richard Reeves wrote in 1993. "In fact, like many of his generation, he thought prejudice was irrational, a waste of emotion and time." 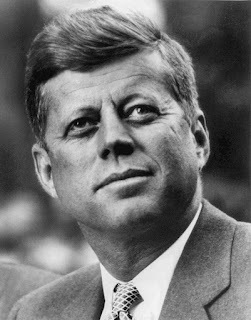 Unfortunately, the assassination of President Kennedy in November 1963 left his Presidency as unfinished as a Schubert symphony. His domestic agenda and his commitment to civil rights - manifested in his June 1963 address on the topic - were stymied in Congress, and the space program was only beginning to move beyond John Glenn's 1962 triple orbit around the earth. The centerpieces of his domestic agenda would be left to his successor, Lyndon Johnson, to push through Congress, and the moon landing would ironically take place six months to the day into the administration of Kennedy's old nemesis, Richard Nixon. The major question involving Vietnam - would Kennedy have withdrawn American troops and advisers had he lived? - remains unanswered. But his cool, deliberative approach to defusing the Cuban missile crisis suggests that he likely would have. Kennedy's greatest legacy as President was encouraging and inspiring America to do better and not to be satisfied with standing pat. It is a sentiment has been tapped by JFK wannabes like Gary Hart, a cartoon Kennedy for the cartoon republic that was 1980s America, and sought by politicians too young to remember Kennedy, like former President Barack Obama. But, in all actuality, no one possessing Kennedy's virtues and values - not even Kennedy himself - could possibly inspire Americans today to pursue public service. People are too jaded. Kennedy's questionable personal life would not have survived the scrutiny of today's 24-hour news cycles, and he likely would have withered from relentless criticism on social media. Indeed, he might have been laughed at by urging Americans to pledge service to country today to provide for a better world tomorrow. After all, look what happened to the most Kennedyesque presidential candidate since JFK himself, Martin O'Malley. I supported O'Malley as someone who hoped to see the Kennedy story repeated, but in a more indulgent, more ignorant, and more cynical time, it's hard to imagine anyone repeating the Kennedy story. The unfinished work he left behind and the squandering in trust in government of Johnson and Nixon left a big hole in this country, but Kennedy's example shows that his faith in public service and what it means to be an American can be revived. But it's going to take a long time before we regain the ability to revive it.